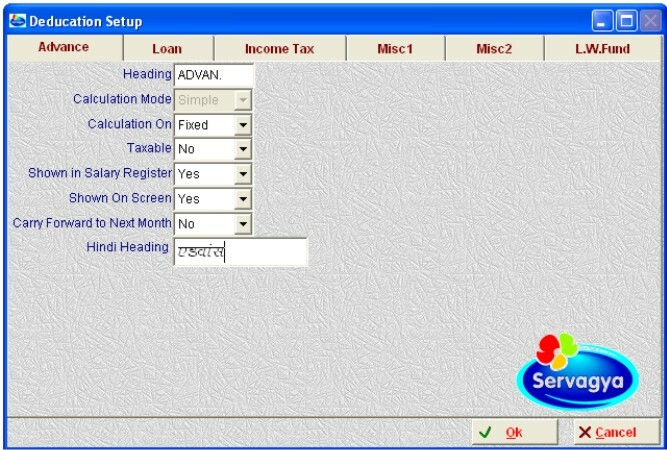 Servagya-Payroll Clients have access to one of the most powerful yet flexible payroll processing engines available in India, as well as being able to meet the statutory requirements of all the six Act(s) of payroll viz., P.F., E.S.I.C., Bonus, Factory, Labour Welfare and Income Tax. Servagya-Payroll is generally able to fully meet client-processing requirements without specific customization with special focus on Statutory requirements of the company/firm. It is generally accepted that Payroll Management is a repetitive administrative activity. If the time and cost can be minimized, accuracy improves along with increased analysis and efficiency then progress is made. 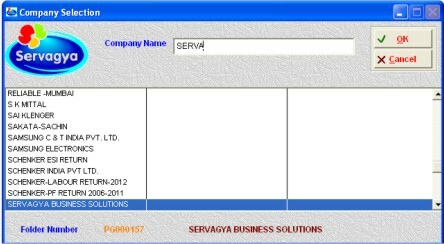 Accordingly, Servagya-Payroll has been developed to expedite the various payroll tasks and ultimate delivery of payroll. Servagya-Payroll software, weighted by payroll preparation, are simplified and automated. 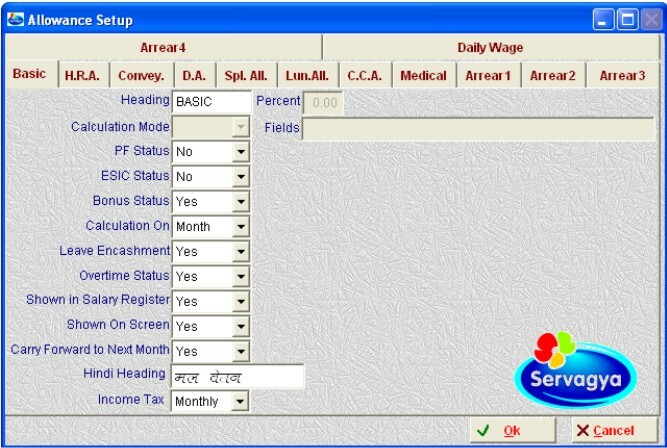 A number of these reports are unique to Servagya-Payroll, for example, generates PF and ESIC challan automatically, generate a floppy for PF office for direct submission to their local office, Generate the report of New Joining and Left Cases, give the report in txt file/PDF file format to use the report with third party software like, MS-Word, Ms-Excel, PDF etc. A special feature included in the software is the Contract Labour Statutory Reports, which is not been found in the general software available in India. 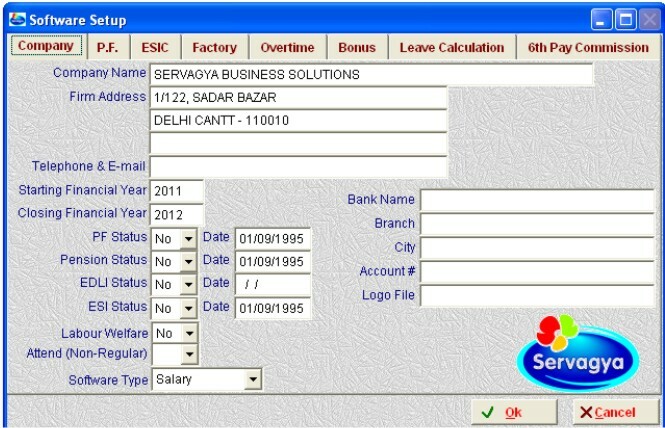 Servagya-Payroll is powerful, yet easy to use. It makes payroll processing a simple job that any company can accomplish in-house. Why depend on outside services to get your company payroll work done right? Our payroll software gives you all the information and options you need to process your own payroll in-house and save money. Servagya has been developing software since 1992. Our payroll knowledge and programming expertise make Servagya-Payroll sophisticated and packed with features, yet easy enough for anybody to use. Define unlimited number of Companies. Define unlimited number of Branches. Define unlimited number of Departments / Units. Export Data of any report to Excel / Text etc. Laserjet / Inkjet and Dot Matrix (Draft) printing. Maintain the records of Actual Payroll employees and Off the payroll employees in the same company (No. 1 and No. 2 Employees). Define Multiple Calculation mode for each earning and Deduction. Define applicability of PF on selective allowances. Define the A/c No. 21 Wages on Full salaries / Pension Salaries option. Define PF deduction on full gross salary or PF salary is again calculated on the working days. Define applicability of ESI on selective allowances. Define TDS applicable on selection allowances. Define Mode of payment (cash/Cheque/Bank Transfer/ DD etc.) for each employee. Define Bonus paid on selective allowances. Define Overtime calculation on selective allowances. Define Leave Encashment on selective allowances. Define Gratuity on selective allowances. Defined on the roll and off the the roll allowances. Define Grade wise pay scale on allowances like the Govt. employees salaries. 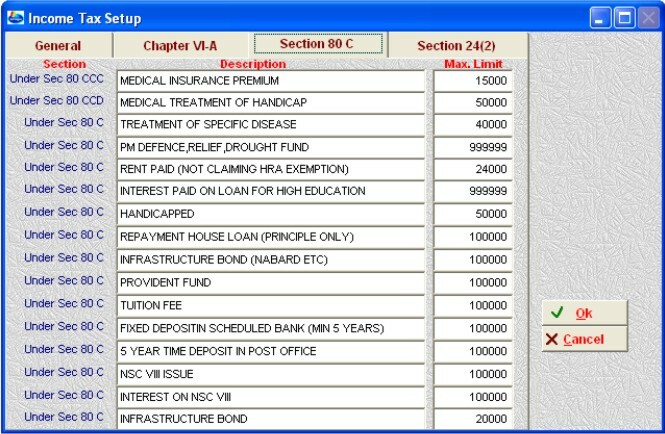 Define unlimited number of Branches/Departments/Designation/Payment mode etc. Define EPF share of employee and employer seperately. Define ESI share of employee and employer seperately. Define employee and employer Labour Welfare fund amount. Define salary calculation on monthly/daily/26 days/fixed method. Define selected allowances and deductions in the original registers and rest in off the records. Define employee wise salary type (Daily/Monthly/26 days). Define employee recruitment type like Direct/On Contract/through Contractor for PF Form No. 12. Define individual employee OT rate on Salary / Manual Rate. Define individual employee PF, ESI Limit for Employee and Employer. Define individual employee Eductional/Technical qualification and experience, family members details, nominee etc. 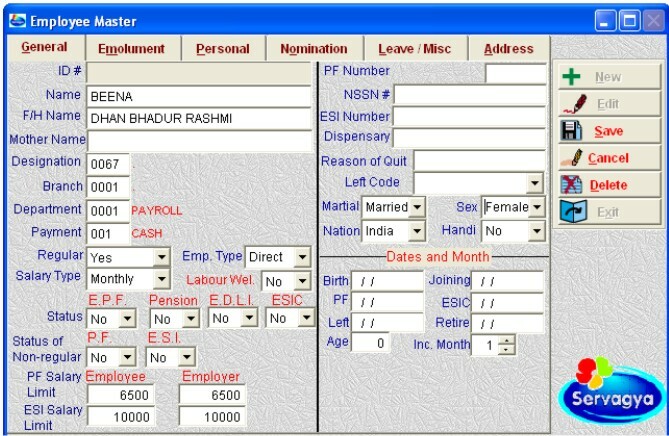 Maintain the database of each employee for Local address, Permanent Address,Telephone No., Date of Joining, Birth and Left etc. Define unlimited number of loans / Advances for each employee. On line loan balance shown at the time of recovery of loan / advance. Define loans / advances recovery monthly or as per employee requirement. Define Overtime on Salary and Manual Rate. Overtime can be calculated seperately. ESIC deduction on Overtime can be maintained. Maintain the percentage of Overtime like single, one and a half or double option. Overtime Allowance can be defined on separate allowances with their own formula as per requirement. Year-wise opening can be defined for EL/CL/SL. 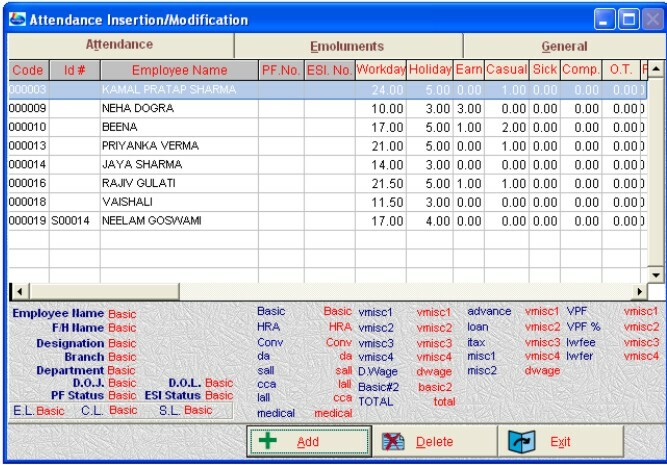 On line leave balance shown of EL/CL/SL while feeding the attendance. Automatic calculation of EL/CL/SL on monthly basis. Option of not calculating the EL/CL/SL on monthly basis, i.e. fixed the leave in the year beginning.